It's a warm welcome to our weekly newsletter bringing you all the goings on from Cheshire's friendliest golf cub. At the time of writing this latest edition the sunshine is bathing the golf course and the temperature isn't too bad, dare we say it but it almost feels like spring and it's only just over a month until the clocks change. Julie & James make their move in the Winter League. Fitting Days reminder " Some special Spring clothing arrivals. Have you claimed your free new grip yet? Free kids taster session next week. Rita & Sandra peak in the ladies Greensomes. It was the penultimate round of the Winter League on Sunday and there was an ominous move into contention by the 2013 and 2014 champions Julie Daines and James Eaton. Their round was going along steadily on Sunday but after a double bogey on the sixth hole threatened to de-rail them James showed his class by finishing par, birdie, birdie to score ten points in the last three holes and catapult them to a 24 point winning total. Julie and James are now looking odds on to claim a place in the semi-finals. There was a close battle for the runners up spot with Phil Sheridan and Tim Hulme (23 points) sneaking into second after a card playoff, John Gunning and Neil Dunning finished in third place also on 23 points. Despite the cold weather 12 pairs scored 20 points or more. Every year the scoring seems to get better and better. The last round of the Winter League is played this Sunday and the forecast looks good so expect some more big scores and lots of pairs will be gunning to finish in the all important final top four positions with it all still to play for. We had our first fitting day of the year last week with Callaway and despite the cold weather we saw a total of 12 golfers who all had a chance to try the 2017 Callaway range. From our own testing we knew that the Callaway Epic driver was good, however we didn't realise just how powerful the matching Epic fairways wood were. We fitted on golfer, Steve Houlston, who picked up 18 yards extra distance with the Epic 3 wood over his old Cleveland 3 wood, and this was not the exception but the norm, another golfer ended up hitting the Epic 3 wood further than his driver. PING - Wednesday, 22 February 2-6pm (slots left available are 4pm and 5pm). 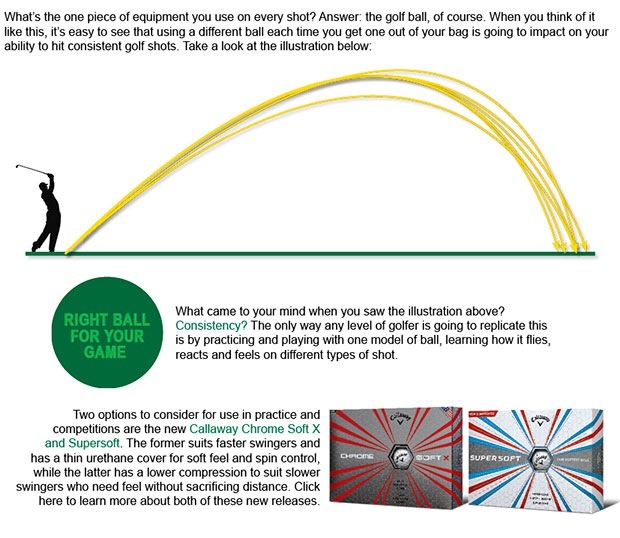 TaylorMade - Wednesday, 1 March 2-6pm ( all slots available except 5.30pm). Just to remind you that on these days we have an expert club fitter on hand to fit you for FREE on any of the clubs in the 2017 range and we have special offers on the day, they always get booked up quickly so contact us here to get booked in. If you can't make these dates don't worry as we have a state of the art fitting studio in which we can custom fit for the following brands - PING, Titleist, Callaway, TaylorMade, Cleveland and Benross, again just get in touch to book your fitting session, with the new season just around the corner we want to make sure that you have the right equipment to help you play your best golf. Great scoring, despite the weather...The ladies played their first 18 hole competition of the year last Thursday and it was a greensomes format, a cold wind made scoring difficult but Sandra Peake and Rita Milburn made light of the conditions to score a very respectable nett 71.8, this score was more than enough to secure victory. In second place were Chris Lever and Ena Rudman on 77.6 and third place went to Kath Hough and Alaine Britton with 78.2, the next ladies competition is a nine hole stableford next Thursday. Good luck to Chris Paxton and Wendy D'Arcy who are playing in the ladies Daily Mail Foursomes knockout away at Heyrose Golf Club next week. For the vast majority of school children in this area it's half-term next week, we have plenty going on for kids with our PGA professional Adam Powell including a free taster session. See the attached poster for full details and we will provide all the equipment, if you would like to book your child on the session please contact us here. Winter League round eight - Sunday, 19 February at 11am. Junior Competition - Sunday, 19 February at 1pm. Seniors away day at Portal Ardenne - Tuesday, 21 February. Ladies nine hole stableford - Thursday, 23 February at 9.24am. February Stableford - Saturday, 25 February at 11am. January seemed to be the month when all the new golf clubs were arriving and now it seems February is the month of new clothing arrivals! Just last week we took delivery of the latest Under Armour Spring clothing followed by the impressive new Galvin Green Collection and any day now we will also see the colorful new FootJoy 2017 range arriving in the shop. Under Armour was our best selling clothing brand of last year because they offer fashionable looking products at decent prices, we can't see sales slowing down much this year either as this latest collection is just as eye catching as usual, the highlight of their latest range is the Storm sweater fleece quarter zip top that as well as looking smart offers a golfer the best of both worlds. A brushed inner layer provides warmth whilst the Storm coating repels rain to keep you dry as well as warm, and at just £49.99 the sweaters really are great value for money. Galvin Green are considered the industry leader in waterproof clothing and every serious golfer seems to own a Galvin Green waterproof suit, well the best have just got better with the arrival of their new C-Knit waterproof technology, added to the Gore-Tex construction (that comes with a lifetime guarantee) the new waterproofs have a C-Knit backing on the Gore-Tex material that means that although it's a three layer construction that keeps out the wind and the rain it's also extremely lightweight. If you play golf regularly in this country a decent waterproof suit is an absolute necessity, and the new Galvin Greens are definitely the best on the market. Here are some photos of some of our new arrivals but they really don't do the new clothing justice so please call in to have a proper look and try some new clothing on so you can see just how good it is. When was the last time you checked the grips on your clubs? No doubt a lot of you will be using clubs that have worn or shiny grips that haven't been changed for years, if at all. Remember that the grip on your club is your only contact point when playing a shot, you can't possibly hit good shots with a worn grip that might be shiny and will be slipping in your hands, you will end up gripping the club tighter and then your swing will be inhibited through tension, a recipe for disaster. 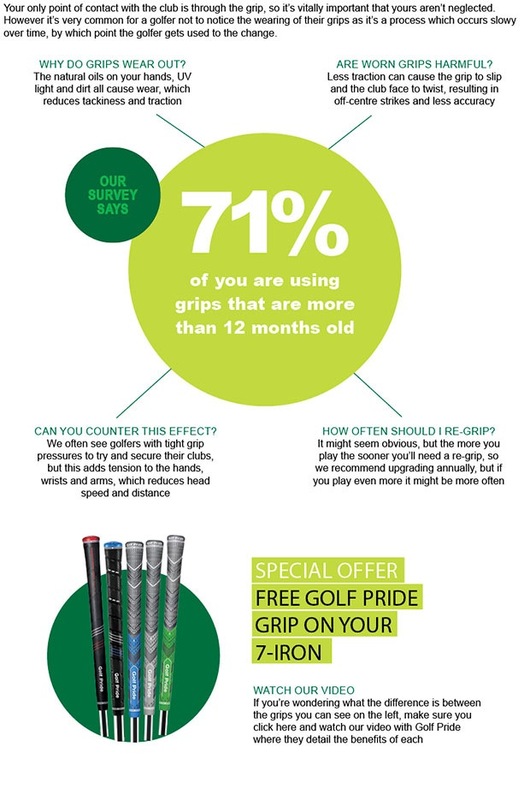 Many of you get used to a worn grip and forget how a good grip should feel, we have a special offer where we will fit a brand new Golf Pride grip on your 7 iron (or another iron in the set) for FREE and you can see for yourself how much better it is to play golf with a proper feeling grip! The grips also come in array of sizes to suit the various hand sizes of golfers so we can also check that you have the right size grip, it really is a no brainer and it won't cost you a penny to get a new grip fitted worth up to £12. Remember that this offer will only run until all the free grips are used up (we only have a limited quantity) so you had better be quick. 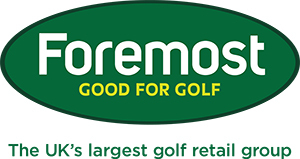 Bring your club in to the shop as soon as possible and claim your new Golf Pride grip. Sergio is renowned on tour for his fantastic personality and this video gives us a little insight into this as he takes golf to a whole new level. Would you beat Sergio at this?